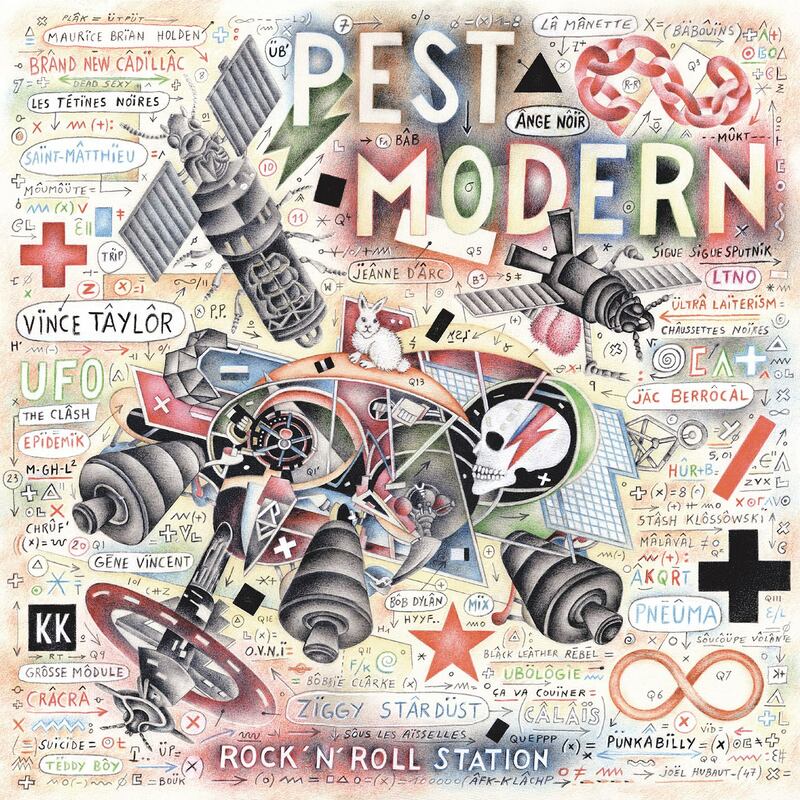 Participation pour une partie de guitare sur l’album de Pest Modern, Rock’n’roll Station. Meta ElectroPunkabilly Meet Sound Poetry ! Pest Modern the project of the visual artist Joël Hubaut and his son the musician Emmanuel bring out their first album « Rock’ N Roll Station on legendary American label Cleopatra Records. The vinyl is edited by Meidosem Records and is released as a special limited edition with a screen-print signed by Joel Hubaut. The idea was born out of the desire to cover the cult track « Rock’n’Roll Station *», fruit of the improbable musical encounter between Jac Berrocal and Vince Taylor in the 1970s. Taking this cover version as a starting point, work began on an album, a sort of UFO circled by satellites with echoes of iconoclast retro-futurism. Mixing psycho-surfabilly guitars, Dantesque voices, feedback, sound poetry, analogue echo, electronic sounds and noises …As Vince Taylor once said, « Everything is possible ». Rock’n’Roll Station propulses us into Beat Galactic turbulence! A french version of Suicide meets Brion Gysin! A transe-rockabilly and sound poetry shooter. Count down for a tin can take-off ! Chluppss tratchppppsss. Agragrra oro grochppps urrrrrtchhfff tfff tff. Puppppss aggrrrraaaaa. Lyrics: Joël Hubaut. Music: Emmanuel Hubaut. Except * Jacques Berrocal. With guest appearances by Carolin Poppenberg on **vocals, and on ***by Nicolas Germain (el TiGeR CoMiCs GroUP) on guitar & modular. Produced by Emmanuel Hubaut. Mastered by Norscq. Artwork Joël Hubaut. Remixes by Grandchaos, Ad Fiction, Mimetic, Scald Rougishl, The Hollow Man, Autist, Magritte Jaco Spaam, Jemek Jemowit, Plateau Repas, Dear Deer, Vince B, Oberst Panizza.